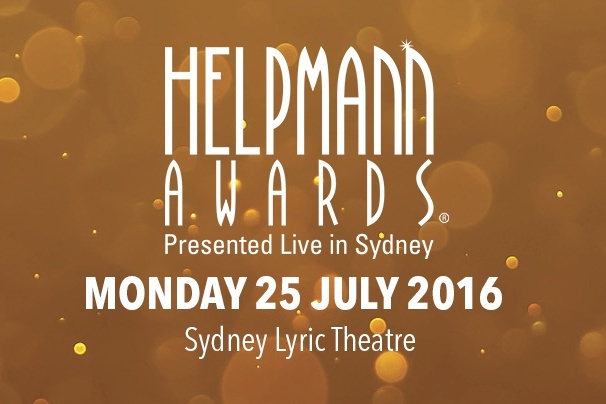 The 2016 Helpmann Awards were presented at a star-studded ceremony tonight, Monday 25 July,in front of a full house at the Sydney Lyric Theatre. Hosts for the evening were Chloe Dallimore, Helen Dallimore, Stuart Maunder AM, Guy Noble, Simon Phillips, The Umbilical Brothers and Queenie van de Zandt as “Jan van de Stool”. The celebrations continued after the ceremony as guests enjoyed an After Party at Marquee Sydney, The Star. The high-profile line-up of Presenters included Kellie Dickerson, Tim Draxl, Marta Dusseldorp, Tim Finn, Antoinette Halloran, Noni Hazlehurst, Erika Heynatz, Celia Ireland, Tim Minchin, Hunter Page-Lochard, Katrina Milosevic, Milijana Nikolic, Eddie Perfect, Aurélien Scannella, The Hon Jillian Skinner MP and Toby Thatcher. At the ceremony, the 2016 Helpmann Award winners were announced in the categories of comedy, cabaret, children’s presentation, contemporary music, dance and physical theatre, industry, musicals, opera and classical music, regional touring and theatre. Awards previously announced and presented live on stage tonight included a special award given to the Melbourne International Comedy Festival for Outstanding Contribution to the Development of Comedy in Australia, the JC Williamson Award® recognising outstanding contribution to the Australian live performance industry presented to Stephen Page and the Sue Nattrass Award®, presented to Michael Lynch CBE AM, which honours exceptional service to the Australian live performance industry. • The Sound of Music – “Do-Re-Mi” starring Amy Lehpamer, Stefanie Jones and the von Trapp children; and “Climb Ev’ry Mountain” starring Jacqueline Dark. The Helpmann Awards Ceremony was presented on the set of Singin' in the Rain at the Sydney Lyric Theatre with Jon Nicholls as Executive Producer. The ceremony was broadcast live on Foxtel Arts and is available via webcast at www.foxtelarts.com.au untilAugust 25.